In alphabetical order - target is 150 by third quarter, 2009, when it is intended to be constituted at Sustainopreneurial Summit. Short bio in 350 characters (or less) with three links (or less). 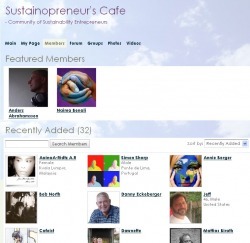 Members of iÆREAS gets PR and extra attention by being featured (extra presence) on Sustainopreneur's Café, the main collaborative conversation and wisdom sharing and building community where the association has a dedicated 'internal' group for members only as well. You also get listed in the membership directory below and over at the updates- and newsflyer-oriented group at Facebook, Sustainopreneur's Square. Upon joining, a dedicated blog post also gets your story told to the world! You also get direct attention and care for your specific venture directly from the Founder - three hours free consultancy within a range of services customized and a la carte (all listed at http://www.ki-work.com/ki-profile/andersabrahamsson where the expertise is showcased, with references, and direct service offerings are publically available), as well as attending all webinars on themes aligned with the services. Systematic membership recruitment started beyond final editing of the book chapter on defining sustainopreneurship research challenges August 21, to be published in mid-September 2008, see Publishing. How to become one of the Founding Members? Go to the membership page! RE:LOVE THE WORLD | Sustainopreneurial Facilitator, Global Knowledge Nomad and Qualitative Intentional Networker who runs five ventures: iÆREAS, SLICE, Ignition®, SEEDS Innovation Fund and DJ Anders - with a daughter just turned one-and-a-half years old, and in a romantic love relationship (after a successful divorce!). iÆREAS Founder. Founder and CEO, TransQure. Medical Practice Specialist. Multi-occupational, multi-lingual transqurist, genuine multi-culti individual. Futurist, humanitarian, sustainopreneur, social entrepeneur, simply because it is a win-win perspective! Mats Frejd, Nässjö, Sweden, is interested in localizing accessibility of renewable energy and support sustainopreneurial ventures in local settings, with main playground in northern Småland, Sweden. Co-founder of "Creator's Bank", Skaparbanken, a local association facilitating sustainopreneurship locally, mainly by hands-on sales training.